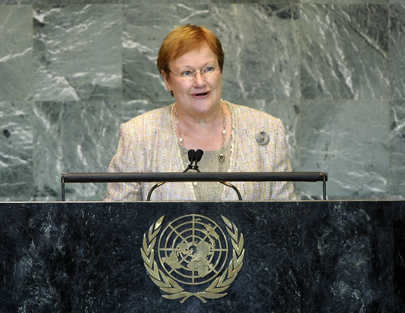 TARJA HALONEN, President of Finland, agreed with the Secretary-General’s assertion that, in the era of integration and interconnection, no country could resolve all challenges on its own. Hence, the importance of the United Nations had grown. That body, what she called the “G-193”, had been a success story. Its guiding principles of peace and security, human rights and development had served well for decades, and the Millennium Development Goals had shown the United Nations global reach. At the forefront in supporting women’s empowerment, its creation of UN Women gave women and girls an even stronger and more unified voice. She said that much had been accomplished since the adoption of the Millennium Declaration and the Millennium Development Goals in 2000, and both had been effective in reducing poverty. However, the work must continue with enhanced determination. The three dimensions of sustainable development — social, economic and ecological — must be respected, she continued. Recent events in North Africa and the Middle East had once again emphasized that those dimensions were interlinked. Alongside President Zuma of South Africa, Finland was pleased to co-chair the High-level Panel on Global Sustainability, and would deliver its recommendations towards the end of the year. The Panel was building bridges between economy, ecology and social justice, for which the empowerment of women and youth was vital. Expanding the Millennium Development Goals into “Sustainable Development Goals” by 2015 could help the world community continue its fight against poverty and enhance sustainable development. There were far too many conflicts in today’s world, rendering mediation, which was at the heart of the United Nations, an important theme for the general debate, she said. That process should be used at every stage of conflict; the capacities of the Organization in that field, thus, should be strengthened. The resolution unanimously adopted by the Assembly in June on the initiative of Finland and Turkey aimed at enhancing the United Nations role in mediation, and she urged Member States to continue their common efforts during the session. She said that as Finland contributed “more than its share” to United Nations peacekeeping, development and the promotion of human rights, it wished to serve on the Security Council for the term 2013-2014. She welcomed South Sudan and a “new Libya” into the world community. She extended her country’s full support to Libya, whose transition reflected the aspirations of the Libyan people. The United Nations should play a central role in coordinating the international community’s contribution, and in that, she welcomed the new Support Mission. Finally, she said, reaching a solution to the Middle East conflict was more pressing than ever. The Palestinians had a right to their own State, and the United Nations must show that it was united in its message to the parties to that conflict. She called for the urgent resumption of negotiations that would lead, within an agreed time frame, to a two-State solution.